Public Works is comprised of three divisions that perform all the duties that help provide us with water, utilities and help maintain its overall physical infrastructure. It is comprised of three divisions: Water & Sewer, Streets and Fleet Maintenance. Each division performs critical functions for our Village and is described in more detail below. The Village has four combined sewer overflow locations along the Des Plaines River. To view information related to any discharges along the River from the Village or neighboring upstream communities, visit the Combined Sewer and Overflow Event Information page available on the website of the Metropolitan Water Reclamation District of Greater Chicago (MWRD). The Village Streets Division handles all public street, right-of-way and landscaping responsibilities including street repairs, our forestry program, brush removal, street sweeping, alley maintenance, snow removal and traffic and street sign replacement. The Village owns and maintains many specialized and common vehicles for providing services to our community. The Fleet Maintenance Division provides and coordinates all vehicle maintenance, repair and mechanical enhancements for our entire fleet - including our Police and Fire vehicles. Remember to disconnect and drain your rain barrel. 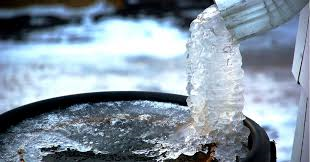 A constant freezing and thawing of the water inside may cause cracks in the barrel. Open the barrel’s spigot and leave it open for the period of no use, this will avoid freeze damage to the hardware of the barrel. Also, clean out the spigot to unclog any sediment. Store your barrels upside down in the winter to keep them clean for future use. If you are a senior citizen or handicapped, please contact the Village for assistance. 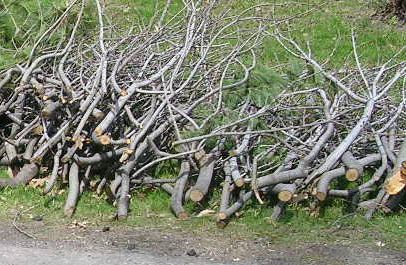 The Village will begin regular pick-ups of yard waste starting on April 2. Place yard waste in brown biodegradable bags and put out on garbage day with your recycling. Purchase bags at local grocery and hardware stores. Residents can select alternatives to bagging yard waste such as mulching mowers, leaf shredders or backyard compost piles to help you and the Village to save money! Click here to learn more about composting. The Village is accepting applications now for the 50/50 Sidewalk Program to replace damaged and cracked concrete on the public sidewalk near your home. Homeowners and the Village share the cost evenly. Please call at 847-671-8217 to be placed on the list for this summer. The Village will contact you to make an appointment to discuss the details. If you apply after May 1, you will be placed on the list for next year. The Village will begin regular branch pick-up service on April 1. Please place all reasonably sized branches where you put your trash for collection by 7 AM on Monday of the pick-up week indicated below. The branches will be picked-up sometime by the end of the day Friday. If your branches are put out late (after 7 AM on Monday of the pick-up week), it is possible that you could miss the pick-up. Village trucks begin promptly and if they have already driven through your section of town, your branches will not be collected until the next scheduled pick-up week. Also, please be aware that due to unforeseen circumstances such as storm clean-up, the Village may need to delay a scheduled pick-up. In this situation, we will resume branch collection where we left off the following week. The National League of Cities Service Line Warranty Program covers the consumer-owned portion of the primary water or sewer service line from the foundation of the home (including portions of the line which may be buried or embedded in a concrete slab beneath the home) to the public utility connection. The NLC Service Line Warranty Program provides generous coverage for repair to the clogged, broken or leaking water and sewer lines serving the residential home when the flow of the line is interrupted due to normal wear and tear. Additional coverage allowances are provided if public street or sidewalk cutting is required in order to make the repair. All permits and line locations, if needed, are obtained by the plumbing professional at no cost to the homeowner prior to making the repair. All repairs conform to the Village's plumbing and excavating codes. Line repairs comply with city code. For questions about this service, or to enroll, please contact Service Line Warranties of America at 866-922-9006 or visit www.slwofa.com. www.SLWofA.com. Water Survey Regarding Cross Connections and Service Lines The Illinois Environmental Protection Agency (IEPA) requires that all water systems in the State have an effective Cross Connection Control Program. Cross connections within the public water supply are a serious concern, as they can allow contaminants or pollutants to enter the public water system through what is called “backflow”. Backflow occurs when a drop-in water pressure causes your water to flow in the opposite direction. This can allow contaminated or polluted water to flow back into your drinking water. Given the IEPA regulations and the dangers that exist from unprotected cross connections, it is necessary to establish and maintain an effective cross connection control program to protect both the integrity of Franklin Park’s water supply as well as to protect our water customers. 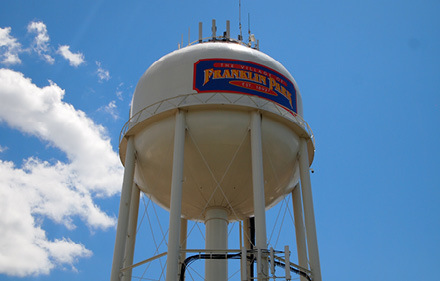 In order to provide the best program possible, the Village of Franklin Park has contracted with Backflow Solutions, Inc. to inspect our water supply. Backflow Solutions, Inc. is a professional service company fully devoted to helping public and private water systems with development, implementation and maintenance of cross connection control program. Also, the Village is required by law to determine what type of service lines exists for all connections in our Village. If you are unsure about how to determine if you have a lead or copper water service line, there is easy to use information below to help you or you can call 847-671-8252. Please complete the survey recently mailed and return it to the Village. You can also complete it on-line at www.bsiprograms.com/surveys. If you have questions regarding cross connections, call 800-414-4990.